Lots of paper, paint, pipe cleaners and patience (yep, that's the four P's right there- always handy!) makes a really good lady bird for a school project! Like many households with young children there is a vast array of paper pictures featuring 'Mummy' or a dog with a cape or a princess. You can never guess what it is (and don't even try, it only causes offence) a lot of these pictures are stored in a file on our bookshelf but pieces of childhood artwork are placed on the fridge,notice board, handed out to Grandparents when I've had enough or simply sellotaped to the wall by Midge when I'm not paying attention. Other crafts we enjoy are seasonal ones. We've made Cupids from loo rolls, stars and pine cones for the Christmas trees and Easter baskets complete with masks most recently. We also dabble in making our own cards and wrapping paper when we feel really adventurous! 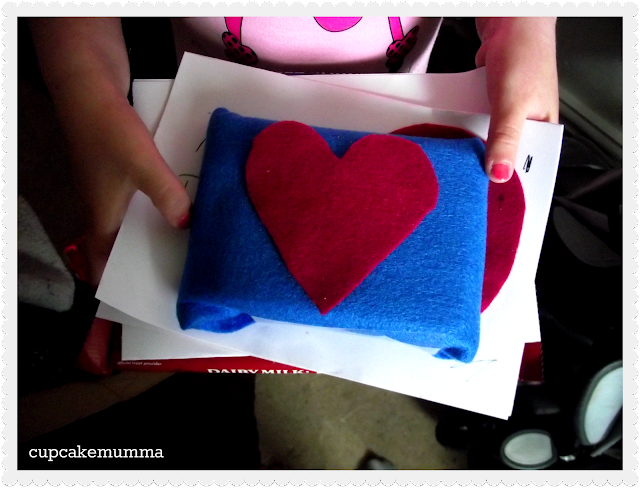 Homemade card and a gift wrapped in felt for Father's Day last year. Feeding the birds with love! Sometimes we even make bracelets. I have quite a stash of jewelry bits and bobs now and we dip in now and again to create something fun. Wow - they're amazing! Esp the bird feeder, I love it! I love doing crafts with kids. Years ago before I had my own I was a nursery nurse. Im always looking for stuff to do with my grandchildren of nearly three and nearly two. My last thing was a working volcano with 2 yr old boy loved except there was no fire,ah well you can't win them all! It's fun isn't it! The volcano sounds fab, I must do that one! Oh my goodness you are so good. Do you have any tips for a Mummy who just can't seem to cope with messy play? That would be a great blog post! Making crafts with my mother fill a lot of my most loved memories from childhood. I love that ladybug, I might have to steal the idea!